Shirdi Sai Devotee Sai Sruthi from India says : Sairam. I am from MP-56 Mahaparayan group. 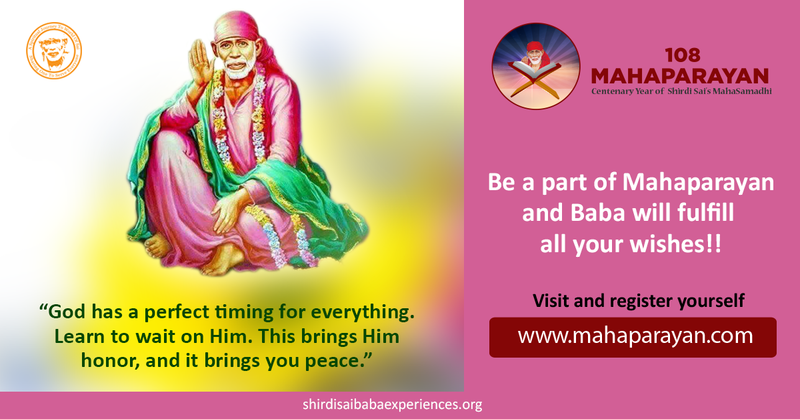 I want to share a beautiful experience which shows that "Baba is always listening to us and His timings are always Perfect". I joined the New Company on April 23rd, so I didn't have my salary from March. This is because, my previous company does not give salary when we put down papers and that will come after a span of 2 months. As per my previous company policy, and from new company I should have got my salary on June 1st but somehow I didn't get it. What have happened was that I had issues with my registered mobile number. I opened a new ICICI bank account with new company when they did test transaction it failed, so I gave my existing SBH account details to credit this month’s salary and on 1st I didn't get it. I was so worried that all my saved money was over and I was left with very small amount. Today morning when I woke up I was just thinking about how I would spend this month, I don't have any money with me. And then I remembered Baba's saying "There Shall Be No Want In My Devotees House". I thought "Baba You said this but I don't have money with me now, how will I live this month?" I am so lazy even to check anything and while I was just roaming around and somehow suddenly I opened my ICICI internet banking, Trust me, I was checking it daily from first, like 5-6 times in a day but I never found it. Today just now I went to accounts section and lo! I saw there was amount in my account. Yes! It was My Salary. I really can't trust myself. I logged out and logged in again and again to confirm, and yes it was really there. I can't share how happy and excited I am now. Thank You so much Baba. The moment I thought of Your assurance You showed me Your presence and gave me Your answer that too at a Perfect time. Your Timings are always Perfect Baba. Happy tears are rolling down from my eyes. Now I just have to wait for three days to change my registered mobile number and I can use my salary from then. Thanks a lot Baba. You know Sai Baba, in how much financial crisis I was. Love You so much and Thank You. Yes no one can beat Baba’s timing as they are just very perfectly perfect! He knows when and whom to give what at it’s best. We just need to trust Him! The life ahead can only be glorious if we learn to live in total harmony with the Lord, and when we are submissive in our actions Sai takes charge of all our endeavors and shortfalls. Love You Sai. Jai Jai Ho Sai!